Ed O'Brien's ambient, ethereal and orchestral guitar style is an essential part of the sonic identity of Radiohead. 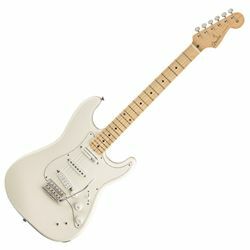 We partnered with this groundbreaking player to create the Fender EOB Sustainer Stratocaster an instrument as unique as his sound. This inspiring guitar is perfect for creating lush, layered soundscapes and finding your own creative voice. The Fender EOB Sustainer Stratocaster offers a wide palette of tones thanks to its Seymour Duncan® JB Jr. humbucking bridge pickup, Texas Special single-coil middle pickup and Fernandes® Sustainer unit in the neck position. The Sustainer works some technical magic to create near-infinite sustain on one or more strings, making it easy to achieve thick, textured sounds. The Sustainer's controls include an on/off switch, intensity control and three-position switch to select the mode: Fundamental-only, Harmonic-only or Blend. A mix of modern and classic, this Stratocaster features a 6-saddle vintage-style synchronized tremolo bridge, vintage-style tuning machines, a "10/56 V" neck profile, 21 narrow-jumbo frets, a synthetic bone nut and a special neck plate engraved with a custom "Flower of Life" emblem. The Fender EOB Sustainer Stratocaster is the perfect tool for players looking to find their own creative voice.